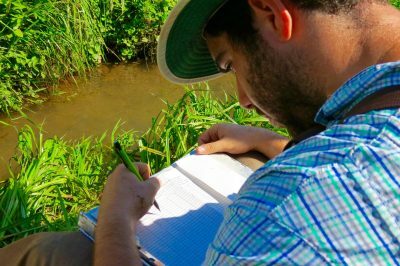 July 26, 2017 – It’s been a summer of learning for Mainspring Conservation Trust’s intern, Guido Schutz. 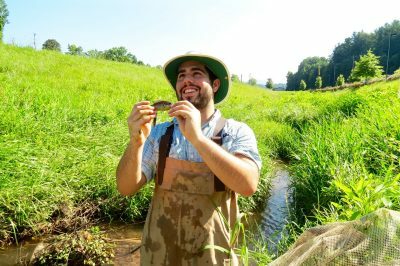 The Elon University senior is part of the Conservation for North Carolina’s 2017 Diversity in Conservation Internship Program, an initiative created to encourage future conservation leaders by creating employment pathways to careers in land trusts and other agencies. Mainspring applied to be a host site, and Schutz was matched with the Franklin-based nonprofit to organize their Geographic Information Systems (GIS) data and be part of Mainspring’s aquatic biomonitoring crew. But the 10-week internship has grown to much more. Schutz will complete his internship on August 4. The Environmental Studies major/Business Administration minor is on track to graduate next May, and plans to continue his education in Europe. He eventually hopes to have a career in the environmental field with a focus on renewable energy, sustainability, or conservation. Funding for this internship was made possible in partnership with CTNC AmeriCorps, the Land Trust Alliance, and the United States Forest Service.